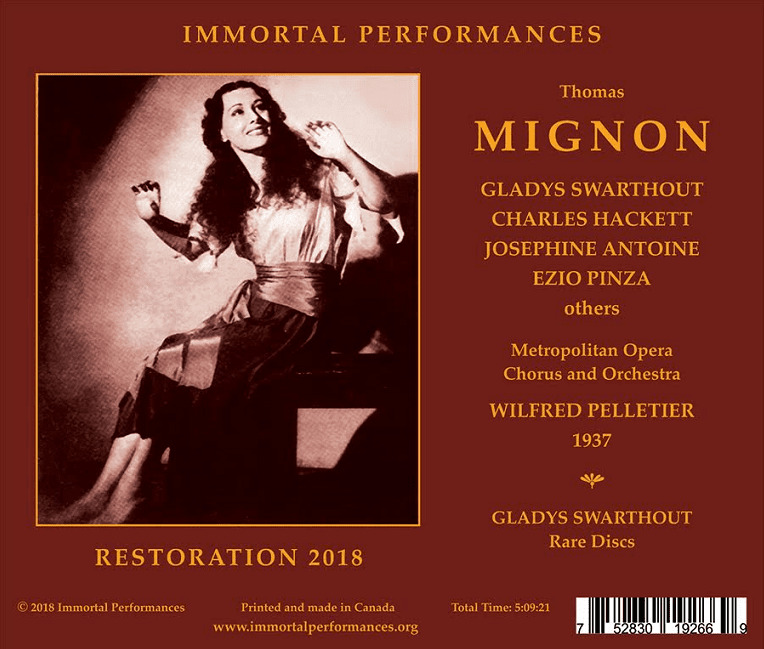 “The unifying presence in a new Immortal Performances issue (four discs, priced as three) is the American mezzo-soprano Gladys Swarthout. From 1929 to 1945 Swarthout sang more than 250 performances for the Metropolitan Opera. Her beautiful lyric mezzo, impeccable technique, and elegant bearing and musicianship served her well in a variety of roles, but especially the French repertoire. Swarthout was also a stunningly beautiful woman who enjoyed a career not only on the opera and concert stages, but in cinema as well. Despite her considerable gifts and fame, none of Gladys Swarthout’s roles is preserved complete on commercial discs, although there are transcriptions of various Met broadcasts. 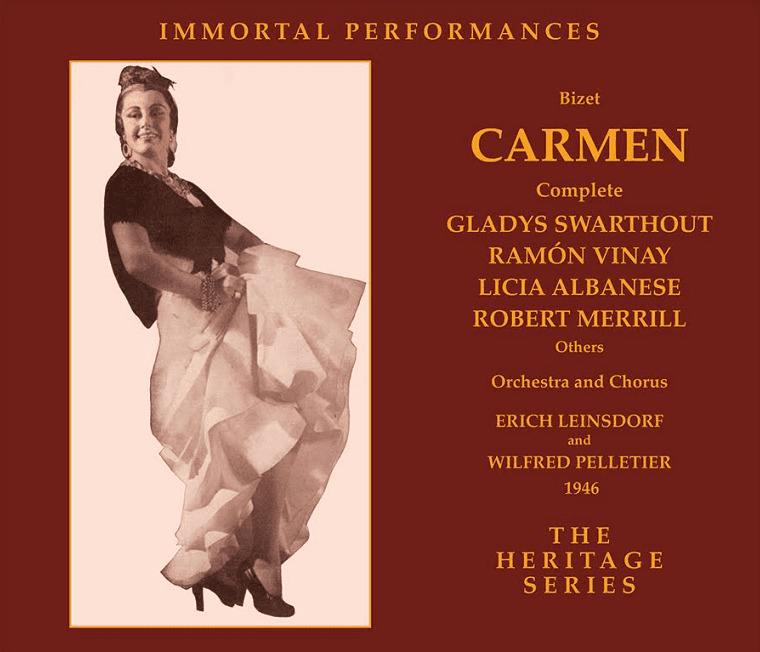 In 1945, RCA recorded what was billed as a ‘Recordrama’ of extended excerpts from Bizet’s CARMEN, featuring Swarthout in the title role, Ramón Vinay as Don José, Robert Merrill as Escamillo, and Licia Albanese as Micaëla. Erich Leinsdorf conducted the RCA Victor Orchestra and Robert Shaw Chorale. 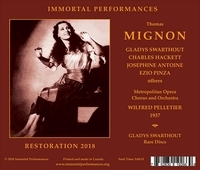 As part of its Heritage Series, Immortal Performances has combined the RCA ‘Recordrama’ discs with excerpts from various 1940s Met broadcasts in order to fashion a relatively complete performance of Bizet’s opera….The interest will focus upon the set’s documentation of several major singers, a laudable function that the Immortal Performances release serves very well, indeed. Swarthout is a superb Carmen, both from a vocal and interpretive perspective. She sings with breathtaking vocal assurance, a lovely focused tone, precise, idiomatic diction, all the while managing to create a compelling, three-dimensional portrait without ever lapsing into histrionics or cheap crowd-pleasing effects. In that sense, Swarthout reminds me of the CARMEN on my reference recording of the opera, Solange Michel in EMI’s 1950 issue, featuring artists from the Paris Opéra-Comique. Anyone seeking an earthier, more verismo approach to this opera and the title character might be someone disappointed. But even if you fall into that category, I urge you to give Swarthout’s Carmen a try. I find that in this case, less is more. Swarthout’s restraint pays huge dividends when, in the climactic final scene, Carmen finally reveals her disgust for the now-rejected Don José. The remaining principals are on a similarly high level. Don José is the Chilean tenor Ramón Vinay. Vinay began his career as a baritone, later reworking his voice to the tenor range. For a decade or so, Vinay was a force to be reckoned with, a wonderful singing actor who excelled in such roles as Don José, Samson, Canio, and Otello. In the mid-late 1950s, the top notes became ever more precarious for Vinay, and he eventually returned to the baritone repertoire, and even some bass roles. But in this mid-1940s CARMEN, Vinay is at the top of his form, and it is truly something to hear. Though Vinay was born in Chile, his father was French, and he studied in France. It’s not surprising then, that Vinay’s French pronunciation and grasp of the Gallic opera style are expert. And what sets Vinay’s José apart from other great exponents of the role, even legendary French artists, is the Chilean tenor’s arresting combination of a rich, vibrant, baritonal middle register with ringing high notes. It is true that, like many tenors who began as baritones, Vinay has some difficulty in scaling back his voice, particularly in the upper register. But that does not distinguish Vinay’s rendition from several other famous and successful Josés. What you do get from Vinay is a superbly sung and acted portrayal, one that, like Swarthout’s Carmen, trades histrionics for restraint, thereby making the confrontations in the latter portion of the opera all the more bone-chilling. I don’t think it’s an exaggeration to say that Vinay’s Don José is one of the finest preserved on recordings, and it alone would justify purchase of this set. But there is also Robert Merrill’s virile and gloriously sung Escamillo. Although Merrill was never the most subtle or insightful artist, his voice, particularly during the 1940s and 1950s, was one of the most beautiful. And, as Henry Fogel rightly points out in his liner notes for this recording, Escamillo is not a particularly subtle character in the first place. The role of Micaëla is divided between sopranos Florence Quartararo and Licia Albanese. Both sing gorgeously, and it is a special pleasure to hear Albanese in prime, youthful voice, without the acidity that could crop up from time to time in later performances (although the artistry was always exemplary). Both Leinsdorf and Pelletier demonstrate a keen sympathy for Bizet’s opera and its idiom, and never allow the momentum and energy to flag. Richard Caniell and Immortal Performances have also done a marvelous job of seamlessly interweaving the RCA studio recordings and the various Met broadcasts…. Although Bizet’s CARMEN remains a part of the Met’s repertoire, it is no longer performed nearly as frequently as during the period of the 1940s recordings and broadcasts employed in the Immortal Performances Heritage Series representation. But the decline in Met performances of CARMEN pales in comparison to the fate of Ambroise Thomas’ MIGNON. From 1883 to 1949, the Met staged Thomas’s Goethe-inspired opera 110 times….But when MIGNON is performed well by a talented and sympathetic cast - as it was for the Met broadcast of March 13, 1937 - the work can still provide much pleasure. This was Swarthout’s role debut, and as in the case of Carmen, she sings with a ravishing beauty, style, and an understated elegance that makes her Mignon a most sympathetic heroine. And what a treasure it is to be able to hear Ezio Pinza in his glorious prime as Lothario. Pinza invests Lothario’s music with such nobility and vocal grandeur so as to take one’s breath away…. Tenor Charles Hackett, in his late 50s and nearing the end of a distinguished career, offers a lovely performance as Wilhelm Meister, rising to the occasion in each of his famous arias. Josephine Antoine is a vocally sparkling and appropriately coquettish Philine. Once again, Wilfrid Pelletier demonstrates his mastery of the French operatic style, with flawless pacing and keen attention to Thomas’ orchestral palette. The broadcast sound is quite fine for its 1937 vintage, often approaching studio recordings of the era, but always more than listenable.